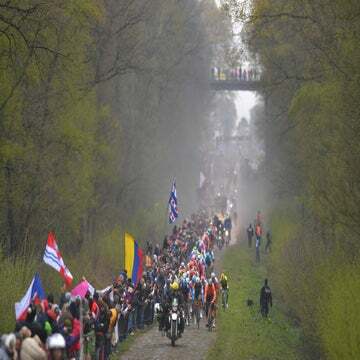 ROUBAIX, France (VN) — Sep Vanmarcke wiped away tears as he recounted scenes from Sunday’s Paris-Roubaix. Vanmarcke, the co-leader of American squad EF Education First, attacked alongside eventual winner Philippe Gilbert with 67 kilometers remaining in the race. Vanmarcke then rode a tactically astute race the next 40 kilometers, marking moves by Gilbert, Nils Politt (Katusha), and Peter Sagan (Bora Hansgrohe) as the front group was whittled down to just five riders. Then, at perhaps the most crucial moment of the race — midway through the Gruson sector of cobbles — Vanmarcke’s rear derailleur malfunctioned, leaving his chain stuck in the 11-tooth cog. Unable to find the right gear, Vanmarcke watched in agony as Gilbert and Politt pedaled up the road toward the Roubaix velodrome. Vanmarcke greeted the press several minutes after he sprinted across the finish line in Roubaix to claim fourth place. In the moments after his finish, the Belgian hunched over a guard rail and stared into the clear April sky as his wife, Hanne, spoke to him. Fourth place is good, but not great, for a rider with such a storied history on the cobblestones. Vanmarcke was fourth here in 2014 and 2016. In 2013 he was second. To lose a shot at the victory in such a cruel and unexpected manner drew emotion from the Belgian cobbled specialist. Vanmarcke’s mechanical capped off a day of setbacks for the EF Education First squad. The team’s strategy was to avoid early breakaways, due to the steady headwind blowing from the north, said team sport director Andreas Klier. EF had two team captains in Vanmarcke and Sebastian Langeveld, who finished on the podium here in 2017. Communication during the race was made difficult by EF’s place within the race caravan — Klier was the 24th of 25 cars driving behind the peloton. Disaster first struck when Taylor Phinney suffered a mechanical early in the race, and the EF team car missed him standing by the roadside. The team’s official Twitter account broadcast news of Phinney’s DNF midway through the race. Then, according to Klier, Vanmarcke crashed in the bunch. 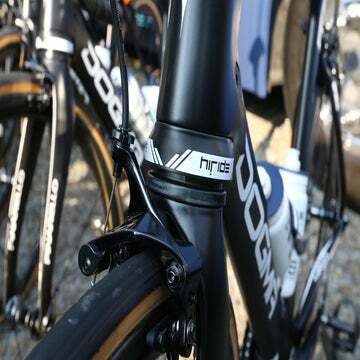 Klier said the crash damaged Vanmarcke’s Shimano Di2 derailleur, and the mechanism went into crash recovery mode. The team car was unable to assist Vanmarcke for several kilometers. When mechanics finally did reach Vanmarcke, he had already lost contact with the main group, Klier said. The result caps off a disappointing classics season for Vanmarcke, who entered the month-long string of races as EF’s co-leader. Vanmarcke suffered a knee injury in a crash at the E3 BinckBank Classic and was forced to sit out of Gent-Wevelgem and Dwars Door Vlaanderen. 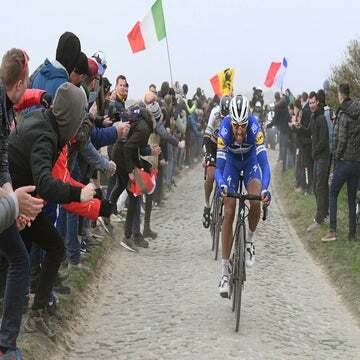 He returned at the Tour of Flanders and played a crucial role in teammate Alberto Bettiol’s surprise win. Vanmarcke said he spent the weeks before Paris-Roubaix resting his injured knee in hopes of having a strong ride on Sunday — a fact that makes the mechanical hurt more.